LA’s best-known food truck dishes up Korean fusion fare. • Kogi Korean BBQ-To-Go was named one of the Top 5 Food Trucks in the U.S. in GAYOT's 2010 Restaurant Issue. : Los Angeles' best-known food truck is a veritable melting pot on wheels. Chef Roy Choi's signature dish is a Korean short rib taco made in the style of the traditional Mexican truck tacos so beloved by Angelenos. Lines of hungry people in the know often form around the block even before it arrives at its pre-Twittered destination, making dining at Kogi more of a scene than simply a way to stretch one's dining dollar. 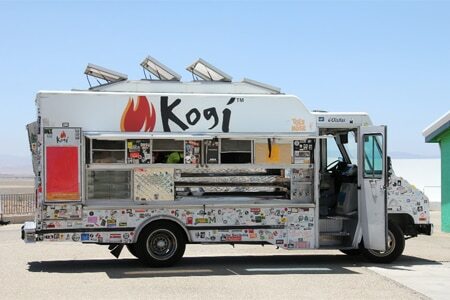 There are now four Kogi trucks that roam the streets. Is it worth the hype? Actually, yes. A fine balance of the sweet and savory, kalbi (short rib) and fresh kimchi makes an enigmatic marriage of texture and flavor with the warm corn taco. 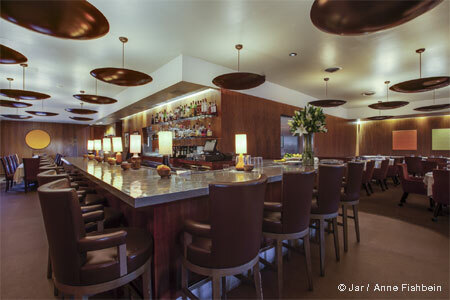 It’s initially surprising on the palate, then addictive. Nearly as pleasing are the spicy pork and chicken tacos, while other dishes incorporate the same winning trademark fusions in burritos, a kimchi quesadilla, and short rib sliders.